For many years, people of all age groups and nationalities had been telling me how wonderful Futuroscope was. When you asked them if it was worth visiting, they would invariably nod their heads unambiguously, solemnly proclaiming it to be one of the best things they ever visited. But when you asked them to explain it, their case appeared to sag a little. It seemed to be a sort-of kind-of sort of place where the future was now and you could see films and touch things and… oh, it’s just fabulous! You have to see it! It’s kind of west of Paris, south of Brittany, near Nantes sort of thing. Everybody knows where it is. From all of that, I got the impression that it was kind of like a cross between an American-style theme park and a super-duper science museum, all flavoured with a bit of French je-ne-sais-quoi in the middle of nowhere. That summed it up more accurately than I thought, as it turned out. It is a very difficult place to categorise if you’re used to the diet of standard theme parks or if you’re just used to normal life. But there’s no doubt that it is fabulous. Futuroscope is located just off the A10 motorway close to the town of Poitiers. It was the brainchild of visionary René Monory, who had the idea back in 1987 of building a site that would be faced firmly towards the future – a place of learning, economic activity, training and entertainment. The first impression is an eye-popping one. The architecture of the place is a sight to behold in itself. From the distance, it looks like a bunch of toy shapes dropped in haphazard fashion by a giant child. When you get up close, you appreciate the huge size of the buildings – each with its own futuristic flavour. The scale of the park is enormous and if you were to see everything, you would need at least two full long days. As with all theme parks the world over, the best approach is to prioritise the parts that you want to visit based on popularity. Starting in the morning, you’re best advised therefore, to go for the undoubted star attraction – Arthur 4D. 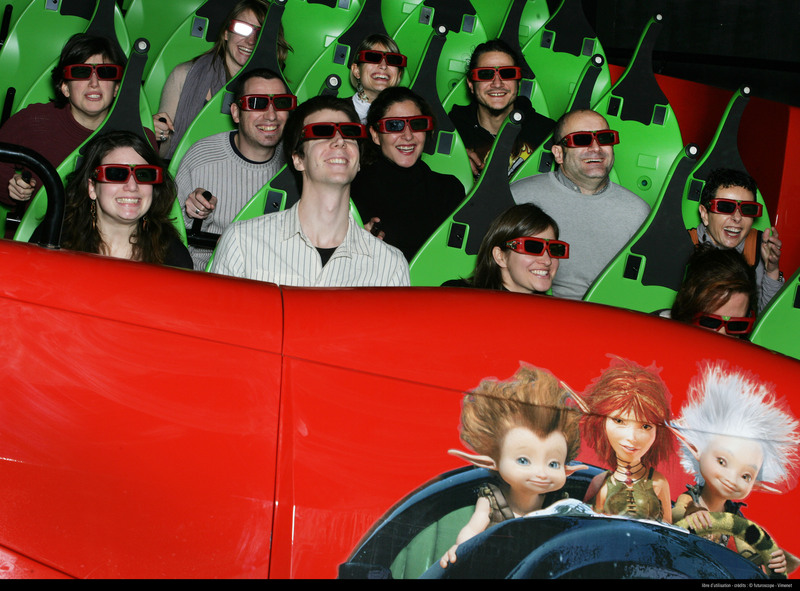 This ride is based on the “Arthur and the Invisibles” series of films by Luc Besson. It’s billed as “4D” because not only are you watching a 3D film on a concave screen, but you’re also in dynamic seating that moves, with special effects that lend an extra dimension to the experience. The result is an exhilarating and thoroughly convincing experience as you’re taken for a helter-skelter spin in a mechanical ladybird under floorboards, through insect cities and out into the garden. You feel the wind in your hair, bee-stings in your back and a million different other things happening so fast that you’re not sure what they are. As soon as it was over, there was plenty of jumping up and down and shouts of “Again, again! Let’s go around again!” The children soon calmed us down though, and suggested that we should move on to the next ride and come back later. One of the oldest in the park is still one of the favourites and one of the most entertaining. The Vienne Dynamique show consists of a film that takes you through the Department of Vienne (the “county” in which Futuroscope is located). Using the story device of a man who gets side-tracked on his way to his own wedding and who’s desperately trying to get to the church on time, the story is shown on an enormous screen with dynamic seats complete with a few special effects. You get to experience many of the sensations that the character on-screen is feeling as he’s thrown around at high speed on trains or driving a Formula 1 car through narrow mediaeval streets. I can see why it’s popular – on the adults’ level, it’s one of the most entertaining tourist information films that you’ll ever see. The special effects of shuddering seats and mists of water in the face are enough to keep the younger audience members entertained. One of the most well-flagged attractions in the park is the award-winning Animals of the Future (Les Animaux du Futur). 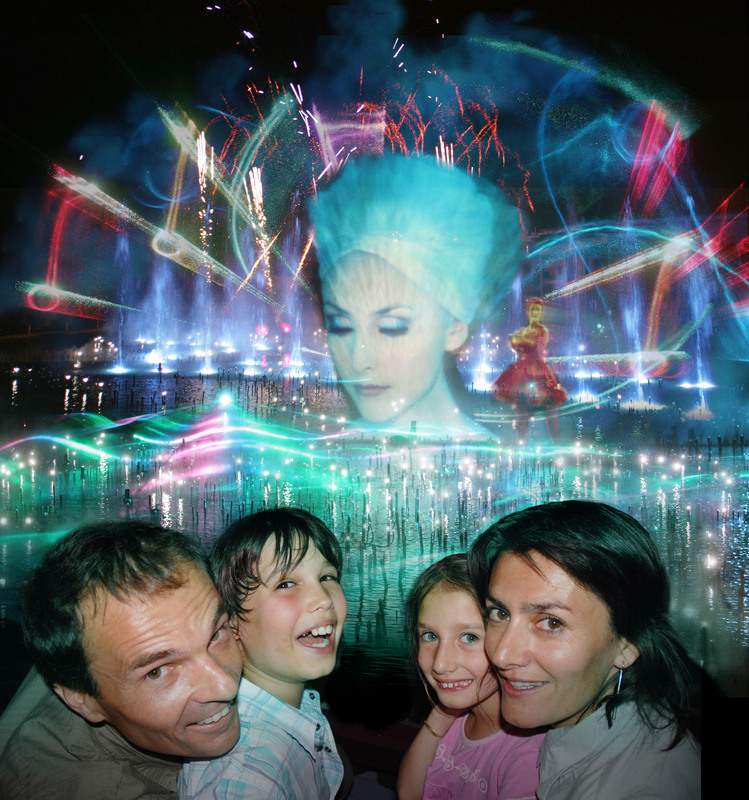 The idea is a 3-D experience where you are strapped into slow-moving carriages, wearing special goggles. You can then “see” hordes of digitally-created three-dimensional animals. Some crawling all over you, your children and your wife and some come and “eat” from your hand if you hold it out for them. The park does have a policy of keeping up with quickly-evolving sciences and the organisers boast that 50% of the park has been renewed in the last two years alone. You don’t have to worry about language problems either, as there are free English-language interpretation guides for all the rides. The central part of the site consists of three lakes over and around which are paths and bridges to go from one attraction to the next. The lakeshore and the lakes themselves are also the locations for a number of other distractions for when you get tired of the queuing or feel like you’ve spent a bit too much time indoors. 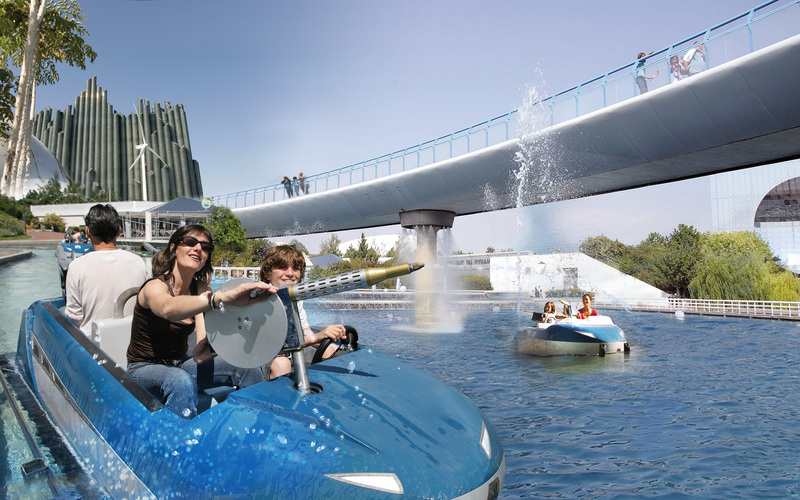 Giant floating tricycles are pure fun to drive around the lake for all the family, while “Mission: Eclabousse!” is for those who are prepared to get soaked in naval battles between boats armed with water cannons. Otherwise, the lakeshore is a good place to relax with a pack lunch or food from the just-about-reasonably-priced restaurants and there are lots of amusements to distract the younger children. Although I was getting weary by the time we got there, the Cité du Numérique (Digital City) was a big hit with children and adults alike. It’s housed in a building that looks like a giant wedge of cheese made of glass with a ball bearing embedded in it. Inside, it’s full of touch-and-feel displays and art installations with a scientific edge. It also includes a very popular Playstation room, where you can get your fill of a whole range of free-to-play computer games. The “Gyrotour” brings you to the top of the park’s resident tower for a spectacular view and after that, it’s well worth hanging around until after dark because the evening show is, as the French might say, the pièce de resistance. “The Blue Note” involves a story told through a mixture of theatre, film, animation, lighting and music. The show’s creator – Yves Pépin – is the same man who brought us the 1998 World Cup ceremonies and who was also artistic advisor for the opening and closing ceremonies of the 2008 Beijing Olympics. The lake is used to superb effect as choreographed fountains and curtains of falling water are used to project moving images as though they’re floating in mid-air. The whole thing is topped off by a spectacular fireworks display that left the entire audience gasping and smiling from ear to ear as they made their ways home in the north-western French night. Getting There:	Both Aer Lingus and Ryanair have regular direct flights from Cork and Dublin to Paris with direct TGV rail connections (1.25 hours) to Poitiers. If taking the ferry, Futuroscope is approximately 500km (5hrs) from Roscofff and 470km (4½hrs) from Cherbourg. When to go:	Summertime certainly, but avoid the weekends when it gets quite crowded. What to See:	As much as possible. If you can, stay for three nights – it will allow for a full exploration of the park without rushing. What to Bring: Sun tan lotion, plenty of bottles of water and snacks in a light rucksack.